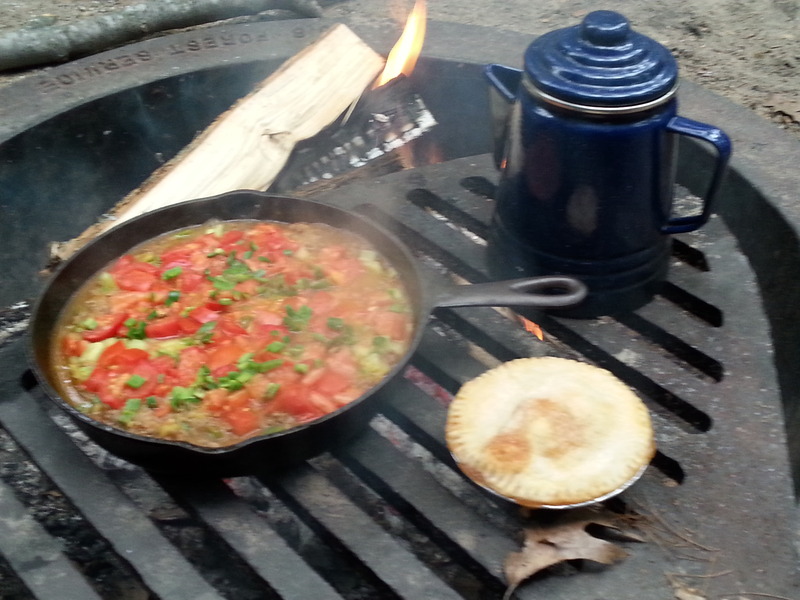 It was a mixed bag for our first lengthy camping outing of the summer. Without any really clever way to organize things, I’ll just take things as they came. Three nights of driveway camping in one of the most scenic spots in NW Michigan started us off on the right foot. My friend Deb rented a cottage near Torch Lake, and when she offered us a spot in her driveway there, we jumped at the chance. 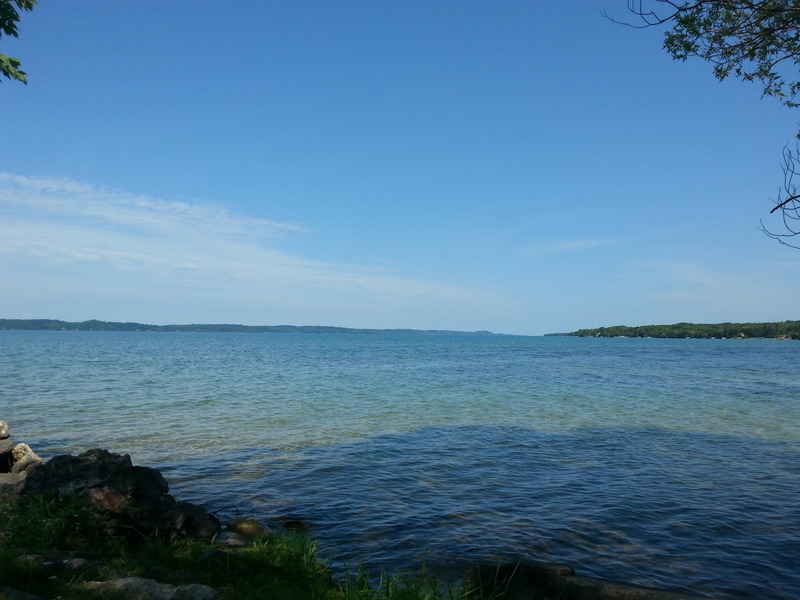 Torch Lake = pontoon boats, campfires, great food, and best friends. This was during the time of the Perseid meteor shower, so we thought there would be great stargazing from the the cottage shore. Well, almost. Wednesday was the grand finale as far as the meteor showers were concerned, and we were primed and ready. All seven of us (plus four dogs) were stretched out in lounging lawn chairs, waiting for total darkness to envelop us, and for the big show to begin. As stars began to pop, we also noticed that clouds were rolling in. Is that thunder? Jezzy’s behavior said that, yes, indeed, it was. 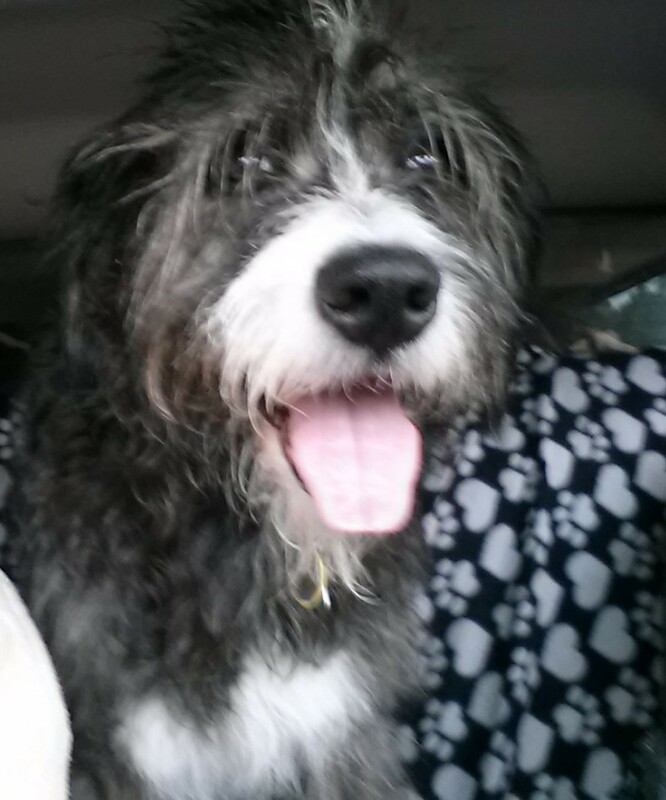 We stalled as long as we could, hoping that we’d catch a few meteor sightings before the rain. All of the sudden, a spiderweb of lightening cracked across the sky and lit everything up. We scattered! Holy cow! What a storm. Thunder and lightening like I haven’t seen in years. Almost worth missing the big sky show for. 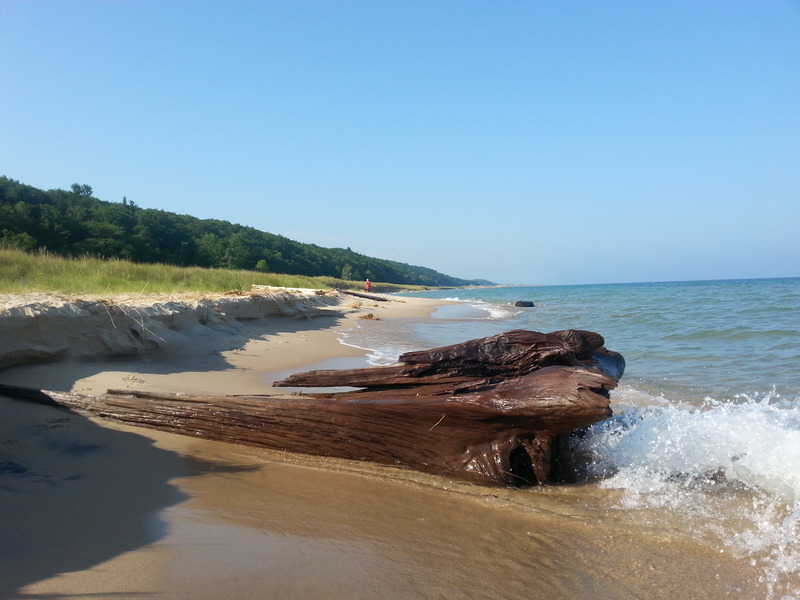 We headed off Thursday morning for Lake Michigan Recreation Area, our favorite campground in the state, in preparation for the Night Shift. 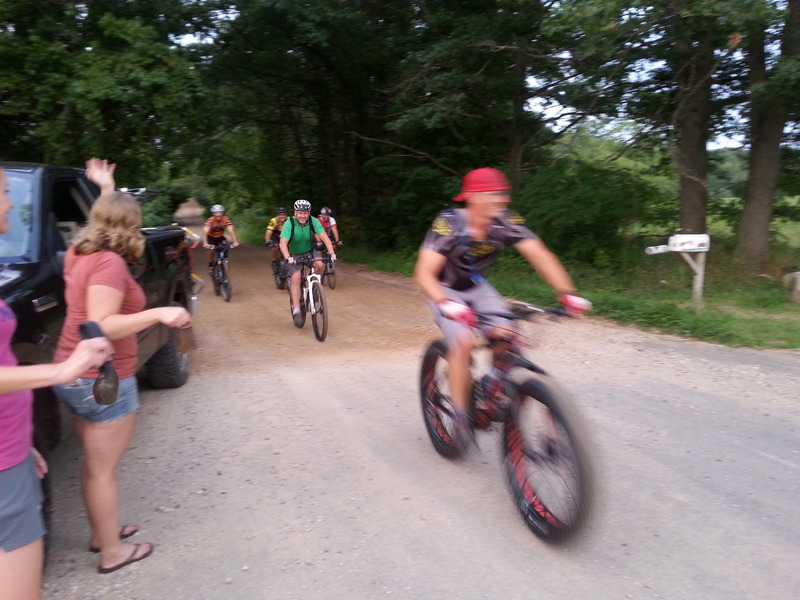 This was to be the 3rd Edition of the Night Shift, an overnight 100+ mile bicycle ride over gravel roads, trails, and seasonal two-track roads in W. Michigan. We’re not silly enough to actually ride – but we love being crew for this wacky bunch – just five riders this year. To sum up the night, in brief….. It was a dark and stormy night. Big time. Lots of laughs. Lost riders. A flat tire (not our truck – the other one) at 4:30am in the middle of nowhere. Weird conversations with curious locals. 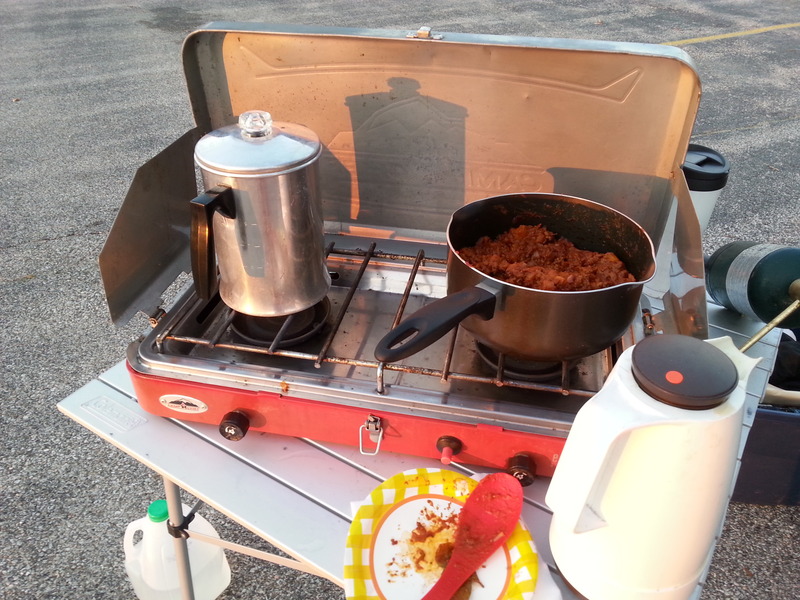 Sunrise and sloppy joes. Coffee galore. Near miss with a whitetail. FINALLY! Into camp at 9:45am – 13hours, 45minutes after rollout. Big breakfast. Zzzzz. This sounds like a crazy ordeal, and it is. But, oh so fun. A day later, everyone has departed. We’ve got six days of camping left, and a few considerable issues with which to deal. First of all, this is a rustic campground – no electric, scattered water pumps throughout, pit toilets. 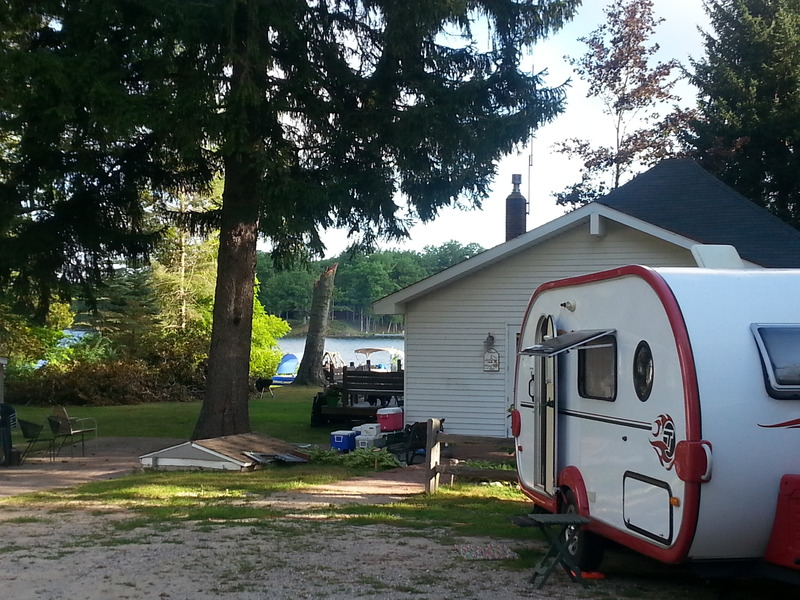 What we love about this campground are the huge shady sites. Unfortunately, ours is so shaded that our solar panels are totally ineffective. After the first day, we know that we have to shut off our refrigeration to preserve our battery power. Not the worst thing, but inconvenient. Worse than this is the fact that we’ve contaminated our fresh water supply with hideous, sulfur-smelling water from the outside faucet at the Torch Lake cottage. We now have no shower, nor any water supply for the camper, other than the one-gallon jugs we fill from the pump. Ugh. When was the last time you went a week without a shower? Horrible, horrible smelling water. But, as usual, Jezzy provides us with comic relief. We had an extended conversation with a confused gentleman who insisted that Jezzy was probably part Mastiff. Do you see the resemblance? No? (random mastiff on left/Jezzy on right). Neither do we! 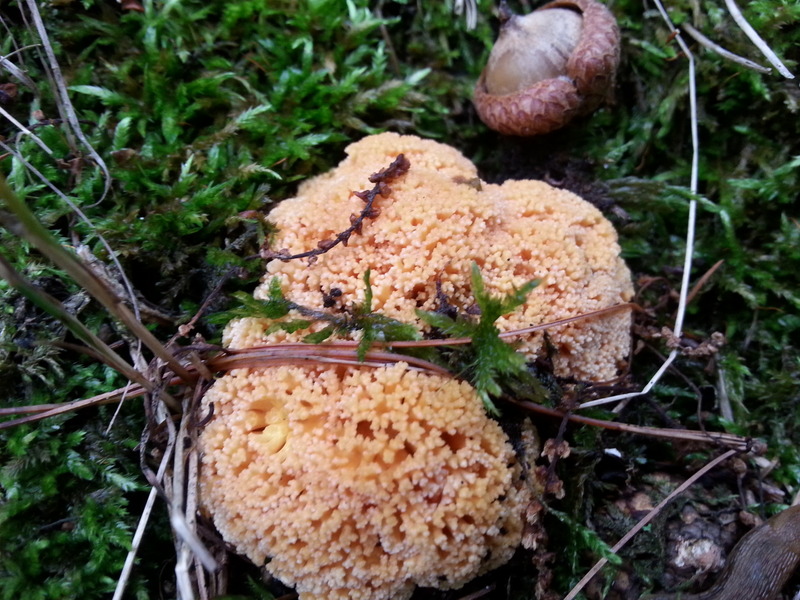 On the bright side, hiking and biking are great – apart from two rainy days. Tent camping friends Cal and Dot joined us for two days and shared laughs, food, and fire. 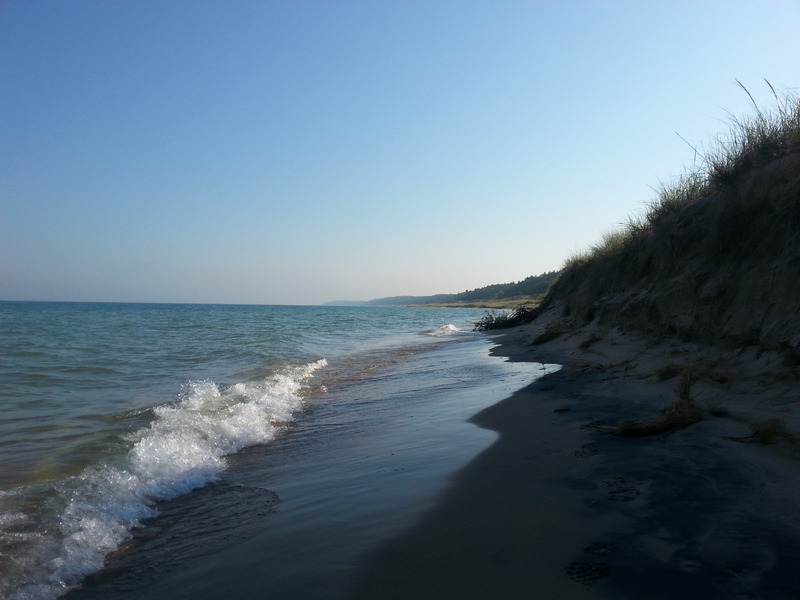 Lake Michigan is approachable for swimming. Beautiful azure waters and decent temperatures. Such a bonus, since it’s our bathtub! Other good stuff? 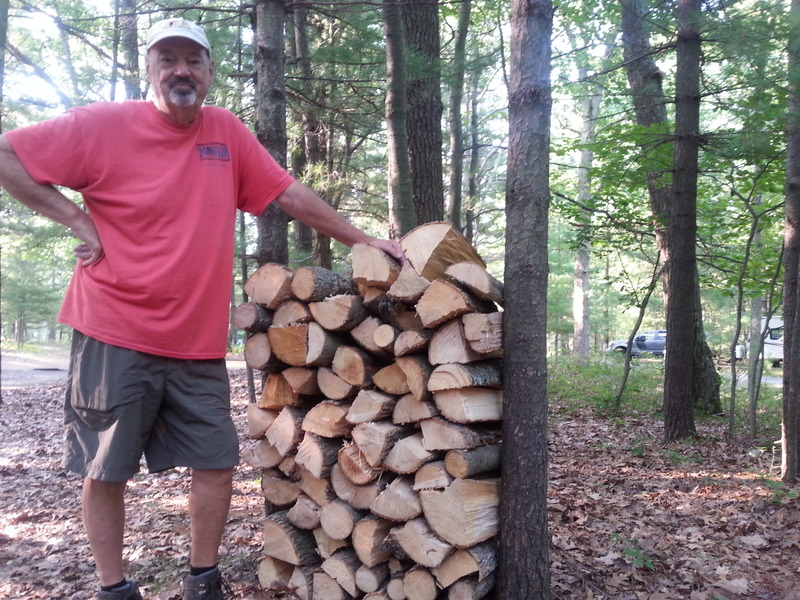 Folks camping next to us offered us the rest of their firewood for $20, and delivered it! A huge stack! We had lots of reading time – amazing what you can do when there’s no internet to distract you (no phone signal, either!) Few bugs. Other than the rain, it was perfect camping weather. I’ll quit while I’m ahead after showing a few more photos. Note to self: polish blog skills! 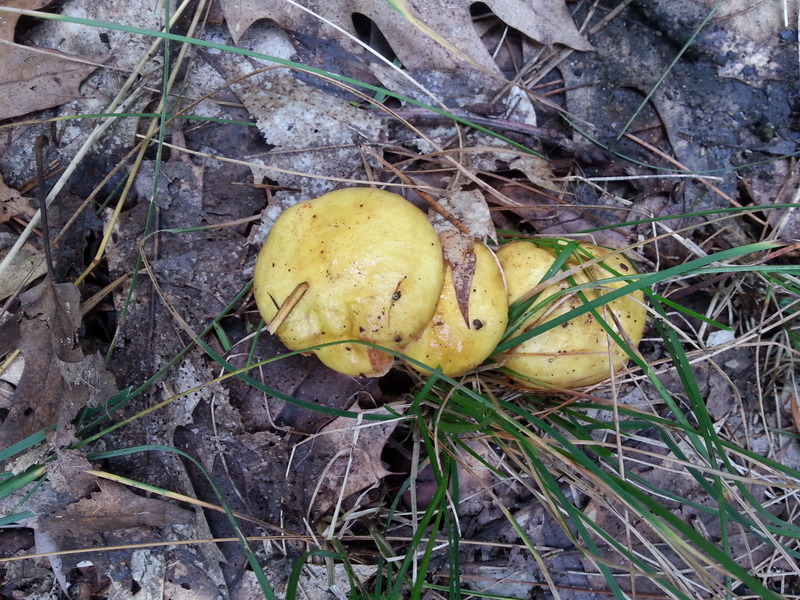 I took a few photos of UFOs (Unidentified Fungal Objects). Always a curiousity. 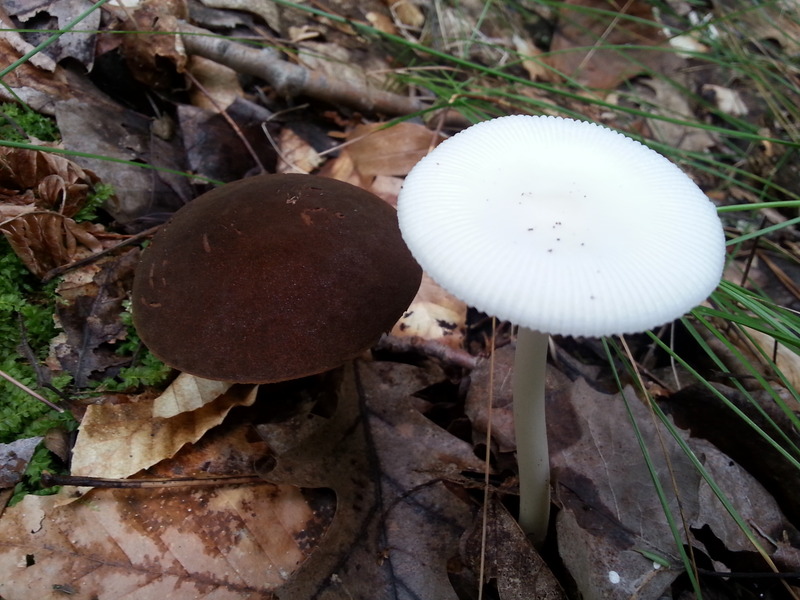 I really liked the contrast of these two growing side by side. 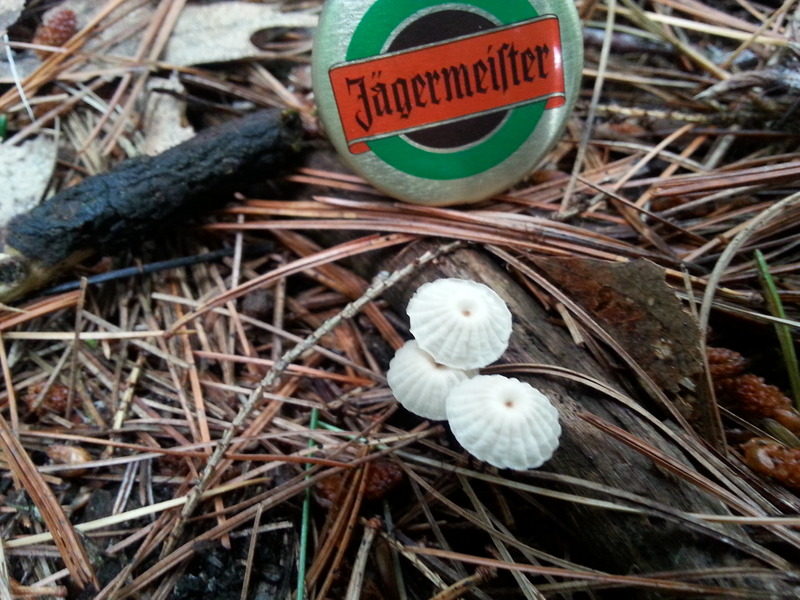 I threw away this Jagermeister cap I found after using it for size comparison. More beach shots…. 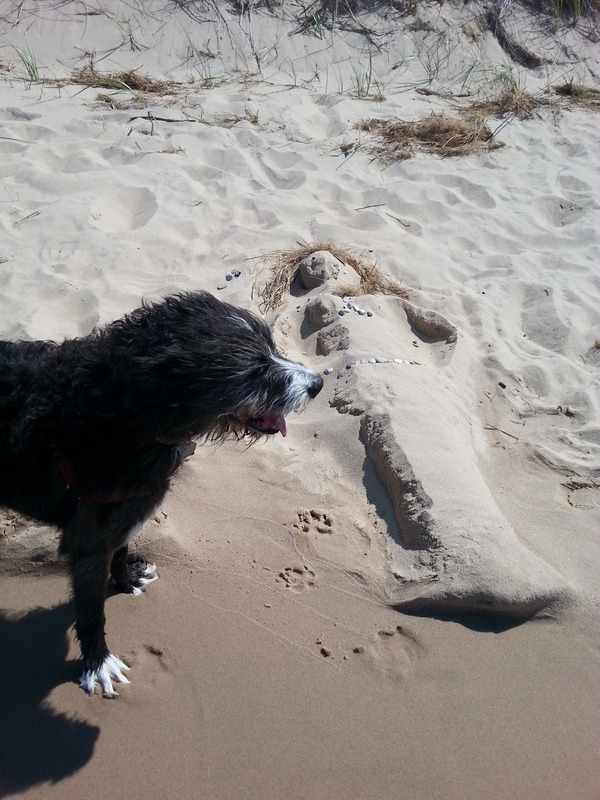 Jezzy found this mermaid mummy on the beach on a very windy afternoon. We resupplied in nearby Ludington one afternoon, and stopped for a beer at Jamestown Brewing. 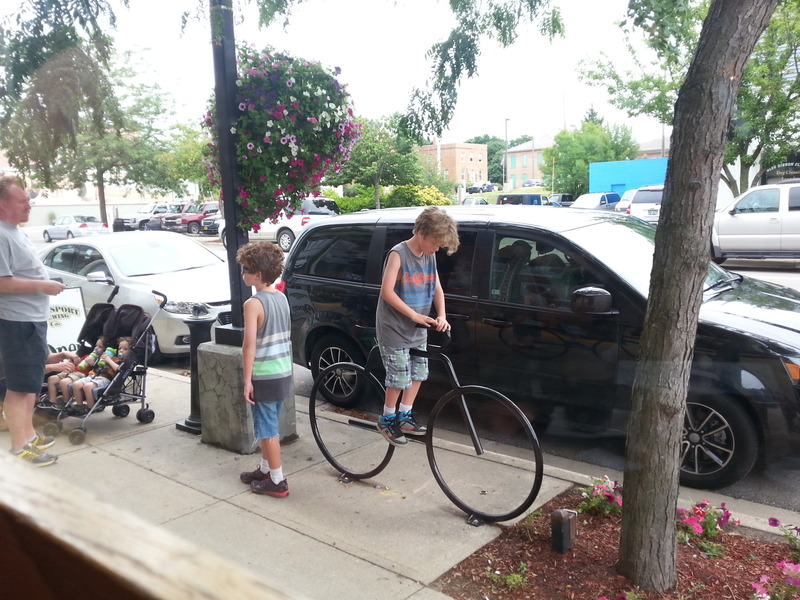 Really liked this kid trying to ride the bike rack. His dad was having a fit! 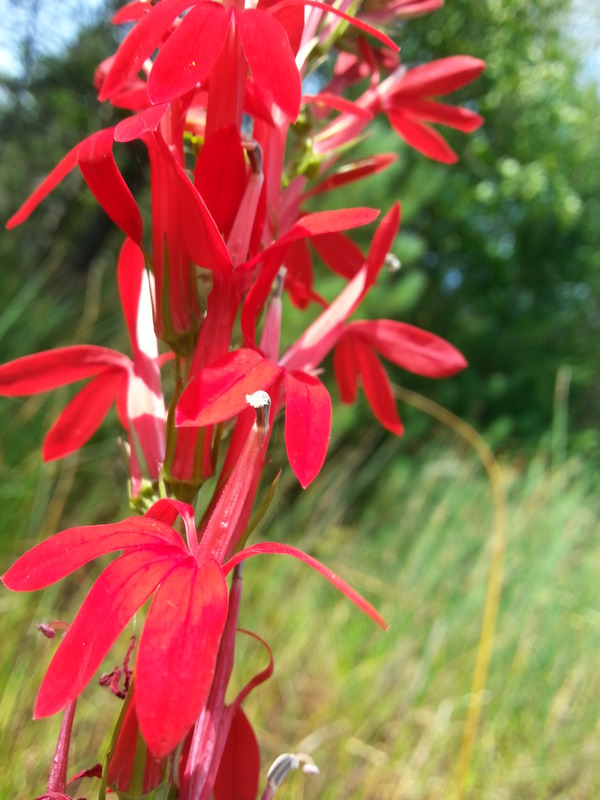 One lone cardinal flower was growing along the roadside. After one day at home, we’ve fixed our water problem (bleach/flush/fill/flush/fill), resupplied and are ready to roll out again tomorrow for another three days at a new (to us) spot. 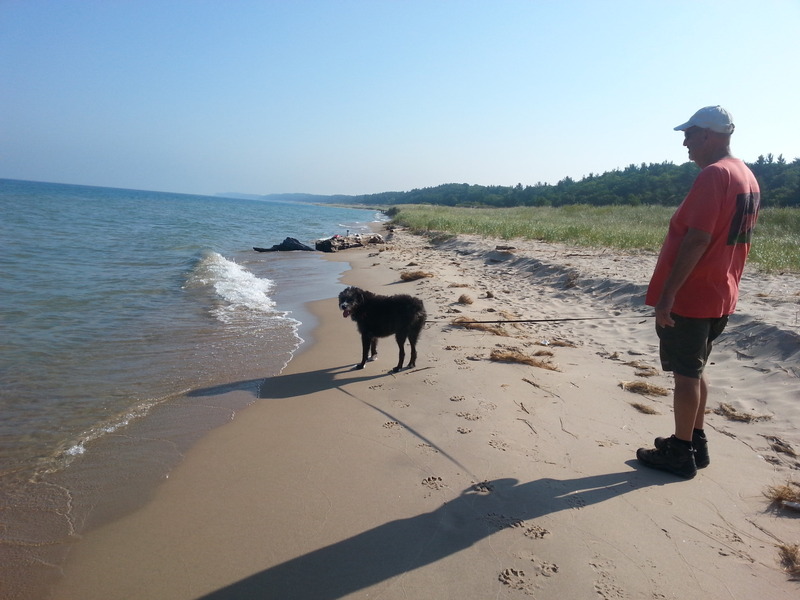 This entry was posted in camping, Michigan, retirement, simple camping, solar camping, T@DA and tagged camping, Michigan, Norhouse Dunes, T@DA by Judy Crankshaw. Bookmark the permalink. It’s beautiful across the pond. Do us a favor and keep the rain over there for awhile, ok? We’d appreciate it! Thanks, Ingrid. Ingrid, you may just gave to outrun it. Guess we’re just in cool, cloudy mode right now. I like the temps, but would like a spot of sunshine. It seems every time something is going to happen in the sky, we get cloud cover. What a disappointment, but at least the storm was enjoyable. I’ll bet the folks in AZ got an eyeful though -seems like it’s always clear out there. We did see a few meteors on the nights preceding the Big Show, so it wasn’t a total loss. We also had a mixed bag of an experience with the Perseids. We heard that a nearby planetarium was sponsoring a viewing trip at Jordan Lake, which is just down the road from us. We turned up at the appointed time. . .along with–seriously–about 1,000 other hopefuls. The place was packed and got even more so as we sat there staring at the sky. The shooting stars we saw were faint and fleeting, but it was still an interesting night. Saw tons of drones flying around–don’t know what people thought they were going to get shots of. Also had people next to us with a laser pointer, which at one point they actually pointed at a small plane coming in. Of course in my normal peaceful and non-confrontational manner I had to say something to them about it. Pretty soon Chuck won’t be able to take me out in public and I’ll finish my days in our attic, just like Mrs. Rochester. Jennifer, if you go missing for any extended length of time, I’ll have someone check out your attic. Chuck will never get away with this! Maybe laser pointers need to come with a more extensive instruction sheet. Good for you for taking that idiot to task. After living in Africa for 2 years, I learned to bathe with only about a gallon of water. (Well and a second gallon for really long hair which neither of you have.). You just need a cup and a bar of soap. Wash one part at a time — one forearm, rinse with cup, one armpit, rinse, etc. You can get really clean this way! Even with our shower, we use less than a gallon apiece for a shower. But, if you saw our tiny interior space, you’d see that it’s a huge challenge if the actual shower can’t be used. The water was unusable – we couldn’t even wash dishes with it. The smell would gag you. Other than finding my navel full of sand after we got home, using the Lake to refresh ourselves worked pretty well. I imagine that living in Africa tought you about all kinds of ways to live simply. We could all use a few lessons and reminders. That sounds like a wonderful trip. So can’t you recharge your battery by hooking up to truck? Around July 26th, We had a Bighorn MOUNTAIN tornado (with all the thunder lightning & BIG winds) roll thru about 8 hours after I was camped where 8 campers in the same spot were destroyed, trees uprooted. My guardian angel pushed me home. I haven’t had solar thus far, and this last trip (10 days) I ran out of battery power. So I bought a basic solar kit AND an Paquequa awning, won’t I be nifty in Yellowstone National Park. 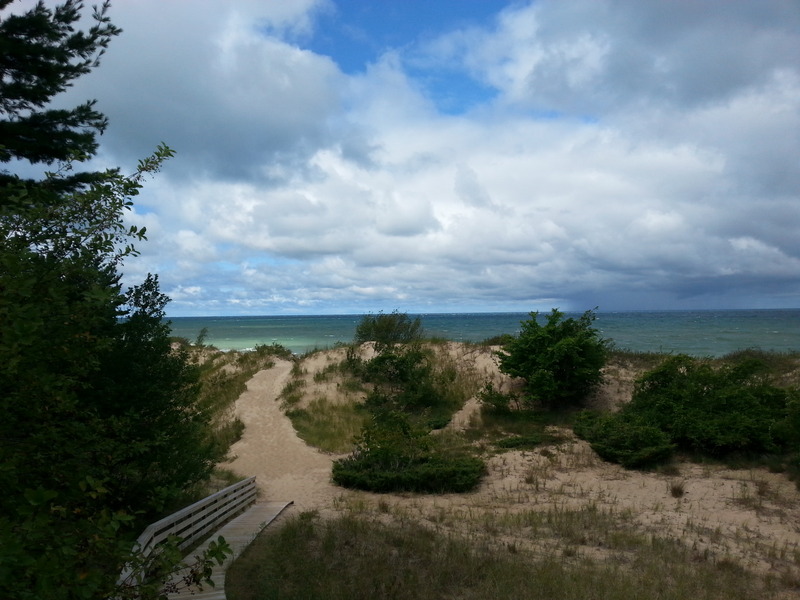 Leaving on Sept 8 back Sept 28~… Are you all staying in MI for your camping fun? Hi Liz! I suppose we could hook up to the truck, but we don’t want to do that. We had enough battery to keep the lights on, and run the fan when we wanted it. Our portable radio provides entertainment. We may have been the best customers at the ice machine at the camp host site – we had brought lots of food since we were quite a way from town. It all worked out in the end. If you have any questions about your solar, feel free to give John a holler. He’s done lots of reading and research to fine tune ours. But 100% shade just doesn’t work! Love the photos on your FB page. Enjoy Yellowstone. We were also ready for the meteor shower while camping in southern Vermont. Best of all, our campfire group included parents of an astronaut! The dad took all the kids into the field and showed them the constellations. Unfortunately, as the night rolled on the clouds did too. But you sure do meet interesting people camping! Camping with an astronaut! You do it all. For most of the two weeks, we had fantastic clear skies – its great to be out in the open to get the big picture, isn’t it? The lightning show that you saw was probably much better than the meteor shower, I’ve tried several times to see what all the fuss was about, it’s never been worth it. Despite some obstacles, such as the water problem and no solar panels, it sounds as if it was a grand time! Having the Big Bathtub so nearby was a lifesaver. It would have been a much longer week without it. The Lake was as pleasant as I can ever remember – winds from the southwest just kept pushing the warm water in for us. Thanks for checking in, Jerry. We went up to Black Rock Mountain State Park, the highest elevation State Park in Georgia (3,500 feet) to check out the meteors also. 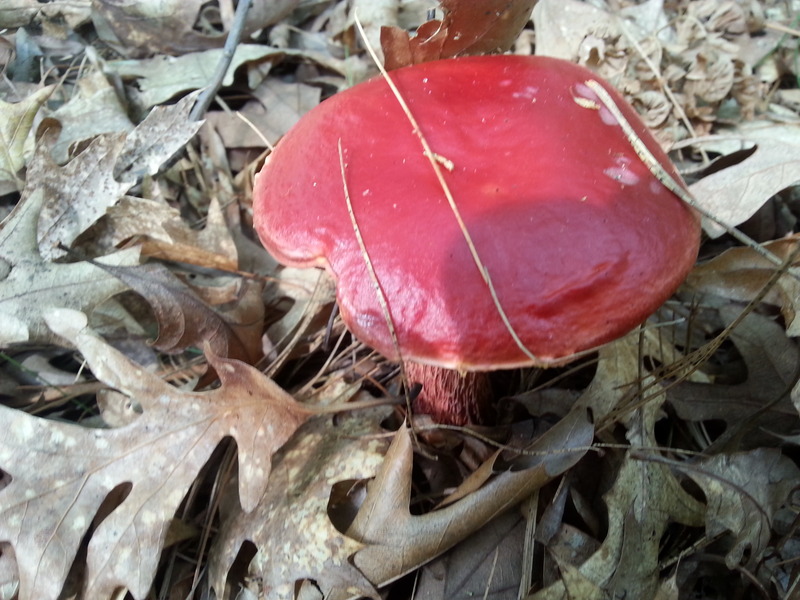 Set the alarm for 2 AM and managed to get out of bed and hiked out of the forest a bit to a clearing. The best views were to the east and we didn’t get that option so much. Saw about 6 shooting stars which were very, very fleeting, so over-all a bit anti-climatic. We’re also leaving in the morning for the oldest State Park in Georgia, Vogel State Park. Going to get in a little fishing and hopefully, the rains last week will have the waterfall pumping for my video :-) BTW … if you haven’t seen the channel lately (not the blog) you’ll know we sold our trailer and are taking a different approach now. Hi Neil! Glad to hear from you – too bad you didn’t get to see the big show of meteors. I’m sure that someone, somewhere saw it – wish it had been you or me. What was special though these past clear nights was how clear the milky way was. We had some fantastic skies for viewing. Will have to check out your channel. Also haven’t seen your blog lately – thought I was signed up for automatic updates, but I guess not. OK, I just watched your video. What???!!! You two have completely changed course. Tired of pulling the big trailer? I’ll look forward to seeing your next chapter. There are lots of fun ways to camp. Our T@DA works great for us, but it sure isn’t for everyone. We sure have had our share of maintenance and repair issues – some of it is just the result of towing a lightweight house over miles and miles of rough roads. Things do tend to rattle themselves apart. We haven’t ventured into Georgia, with the exception of one state park in the very nw corner. Nice to really explore one state, isn’t it? Hey Judy, You got me thinking about the blog so I checked it last night and it was updated with our Yosemite trip after all. I guess I should keep it going with the description of our new “Prime Directive”. We’ve lived in GA now for over 25 years (from CA) and we’re always amazed at how beautiful it can be. The summers are (by most people’s standards) intolerable but if you can find parks with a little elevation it makes a big difference. Hope to get the latest video up by the end of the weekend. Did you happen to watch the one from the 1015 BRR ?